Our Beaucerons are not bred before they have full health testing including Hips, Elbows, Heart, Eyes & Thyroid and are at least two years of age. Breeding is taken very seriously and we don’t place puppies until they have spent 8 weeks with their mothers so they are well adjusted. Our Beauceron puppies are raised inside our home until they are 5 weeks then go outside to learn about the big world. They have field trips on the farm and are introduced to smaller farm animals so they do not learn to chase (Cats/Chickens). The outdoor puppy kennel is located right on the gravel driveway in sight of our living room where the Quad runner, tractor and vehicles pass within 5 feet of their kennel. We add a tarp overhead to flap in the wind above their heads. The tarp helps to desensitize a puppy from unexpected noise. Field trips include pasture walks among cattle and horses and hikes in the woods. We do early stimulation on the puppies from the 3rd to the 13 day and give them an enriched environment of baby toys that make noise when touched in the house. We add elevated surfaces and odd texture surfaces so they are used to change. Our Beauceron puppies begin learning about their environment from birth until they go to their new homes. To see available litters, click the “Available Puppies” tag on the side menu. 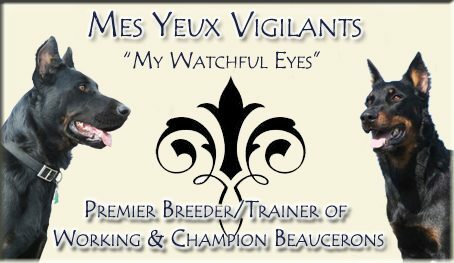 Please Note: Litters listed here may reflect litters from co-owned dogs, litters of friends, and those who have used Mes Yeux Vigilants for stud service. To see all of our litters (including litters from previous years), click the “Litters” link on the side menu. A $200 deposit will hold a puppy for you. Picks are normally first come-first serve. Deposits are non-refundable, except in extraordinary cases (for example, if you place a deposit on a male and I have no males in the litter). Refunds are wholly at the discretion of Mes Yeux Vigilants and will be on a case by case basis.